Enjoy the popular traditional look in your bathroom with this beautiful vanity. The black granite counter and white solid wood base make this piece great for any bathroom. It comes with a double-door cabinet and drawers for even more room to keep items. This classic set from Simpli Home will make your bathroom look brand new. Bring a fresh, modern look into your bathroom with this vanity. Its beautiful white ceramic counter and brown solid wood base bring a great new look into your bathroom. Put a nice twist on your bathroom project with this classic piece from Avanity. Bring a fresh, traditional look into your bathroom with this vanity. With a white engineered stone counter and black plywood base, this product is good-looking and useful. Add a classic feel to your bathroom with this simple vanity set from Bellaterra. Cambridge 49-inch W 6-Drawer 2-Door Freestanding Vanity in White With Granite Top in Black Enjoy the popular traditional look in your bathroom with this beautiful vanity. 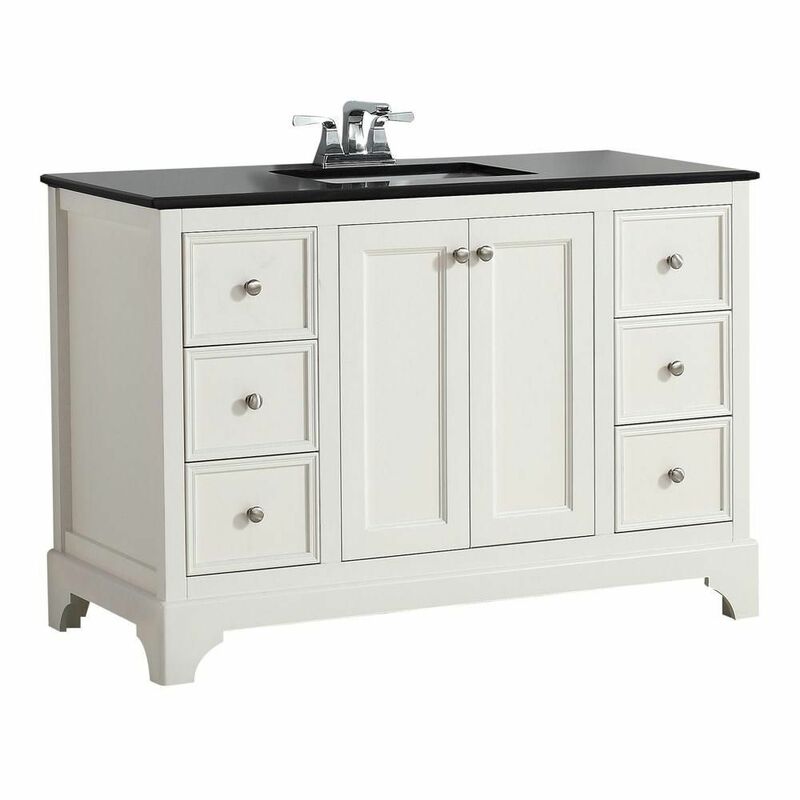 The black granite counter and white solid wood base make this piece great for any bathroom. It comes with a double-door cabinet and drawers for even more room to keep items. This classic set from Simpli Home will make your bathroom look brand new. Cambridge 49-inch W 6-Drawer 2-Door Freestanding Vanity in White With Granite Top in Black is rated 3.0 out of 5 by 1. Rated 3 out of 5 by CC from Very pretty vanity, however, the drawers do not close all... Very pretty vanity, however, the drawers do not close all the way unless you push hard. Since most people do not push hard enough, it almost always looks like the drawers are open slightly.